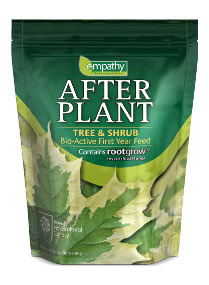 EMPATHY AFTER PLANT. All Empathy After Plant products have been produced to be biologically active, and truly sustainable so they will harmonise with nature and the environment. Their active ingredients are nitrogen obtained from alfalfa, potasium from Comfrey, Bocking 14, a cultivar of Russian Comfey developed in 1950s. Also seaweed which is harvested sustainably in very clean water in South Africa and then transported in a concentrated form, and organic matter from highly concentrated natural sources. The natural humates contain organic acids which help to build highly fertile soils and are a source of energy for beneficial soil organisms. These products are truly natural and will not leach out from the soil causing possible pollution in waterways as many other fertilisers do. All After Plant products are endorsed by the R.H.S. This product is tailored for the needs of trees and shrubs, but other After Plant products are more specifically for Evergreens, Roses and Ericaceous plants. As other After Plant products, this is an organic product which will benefit both the plants and the soil.